Sebastian Vettel had virtually led from start to finish after launching away from pole position and easily retaining first, even without KERS. Lewis Hamilton came in second after an impressive turnaround of McLaren performance while Vitaly Petrov brought Lotus Renault its first 2011 podium. Sebastian Vettel made the best start possible to his first race as a world champion as he took an impressive lead after just 2 corners. After starting from pole, he is 2.4s ahead after a single lap. Second is Lewis Hamilton, closely followed by Mark Webber. 4th is Vitaly Petrov, 5th Massa thanks to an impressive start up from 10th. Button is charging all the way through the first 3 laps and even in lap 3 with the moveable wing activated he is unable to really get ahead of Massa. Fernando Alonso had a rather bad start as he got stuck on the outside of turn one and was eventually pushed into the grass aside of the kerb, causing him to lose 3 places. 2 laps later he regained them however, all with fairly simple moves. After lap 1 Schumacher came into he pits with a rear tyre puncture caused by Alguersuari bumping into him. In the same scrummage Barrichello ended up in the gravel but was able to recover from that. On lap 12 Button gains a place on Massa but uses the escape route on the exit of the first chicane route. Three laps later Alonso passed Massa as well to take on another set of scrubbed soft tyres. 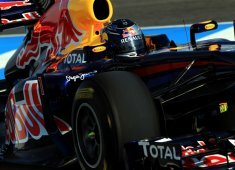 Mark Webber was the first man to pit in lap 11, taking on the harder tyre. Many drivers followed that action. Massa did as well on lap 13, taking the harder tyre just like his Ferrari teammate did. On lap 14 Vettel makes his stop for a new set of softs. Before his stop he was just 2.5 seconds ahead of Hamilton. In fact it is stunning to see McLaren and Lotus Renault being able to run longer on the tyre, while Red Bull were supposedly easier on their tyres. On lap 15 Jenson Button is handed a drive through penalty for his incorrect overtaking move on Massa. He did manage to hold up Vettel for half a lap just after Vettel came out of the pitlane from his stop, but still the World Champion managed to keep the advantage on Hamilton after the latter stopped on lap 17. In lap 22 Kovalainen is aside of the track with an apparent technical problem. 2 laps later Barrichello adds Rosberg to the list after bumping hard into the Mercedes GP sidepod. Barrichello was too optimistic into turn three and had to give in several positions himself as he found himself facing the wrong way. Barrichello is later handed a drive through penalty for causing the collision with Rosberg. It also leaves no MGP car left in the race as Schumacher already stopped in the box after struggling all the way since Alguersuari bumped into him on lap 1. It appears his floor was damaged in the incident, while Michael also believed he had a bent rear suspension. The team took him out of the race for safety reasons. Meanwhile Webber and Alonso have both pitted around lap 28, on target for a 3-stop strategy. Webber who lost his third place to Petrov due to his stop is now seeing Alonso in his mirrors as well. Hamilton meanwhile is struggling to keep up his pace as the front splitter is now scrapping over the floor. It is apparent that the titanium support to keep the element attached to the monocoque has failed. On lap 36 Vettel is complaining he has no grip left on his tyres. In fact the tyres don't even allow him to be quicker than Hamilton. At the end of that lap, Vettel is in while Hamilton also makes his stop at the same time, as well as Petrov. Both Petrov and Hamilton have taken on the hard tyre. McLaren stayed out and pitted Button one lap later as well, also taking on the hard tyre. Vettel on the other hand took on the softer compound. On lap 42 Mark Webber makes another stop and taks on the softer tyre again. Alonso pits one lap later to cover off that stop and manages to gain a position, although he got Webber on his back just 5 turns into his out-lap. This could be an intersting battle as Webber is on a softer tyre than Alonso, but has got no KERS but will be able to deploy DRS. Rookie Sergio Pérez in the Sauber is meanwhile putting in a nice race. At one time he set the fastest race lap and is consistently following the McLaren of Jenson Button in 7th place. While the top cars are changing tyres frequently, the young Mexican has only made one single stop and is fairly competitive against Button. On lap 49, after getting passed by Button, Massa pits again for another set of soft tyres. At the chequered flag, Vettel is unsurprisingly first to cross the finish line after leading the complete race. Lewis Hamilton came in second while Vitaly Petrov secures his first ever F1 podium after a brilliant and consistent race. After the race, the Australian GP stewards decided to disqualify both Sauber F1 Team drivers over the infrigement of technical rules 3.10.1 and 3.10.2 in the uppermost rear wing element. Pérez finished the race in 7th position, just in front of his team mate Kamui Kobayashi. Due to the disqualification, the drivers who finished behind the Sauber duo move up 2 places.